I've been having these random rushes of creative drives recently that just needed to be satisfied. I used to divert these creative drives to designing, doodling, sketching, painting, and whatever I could lay my hands on. It's not until recently that I've realized I can use people, a camera, makeup, and clothing to bring out whatever images I saw in my head. 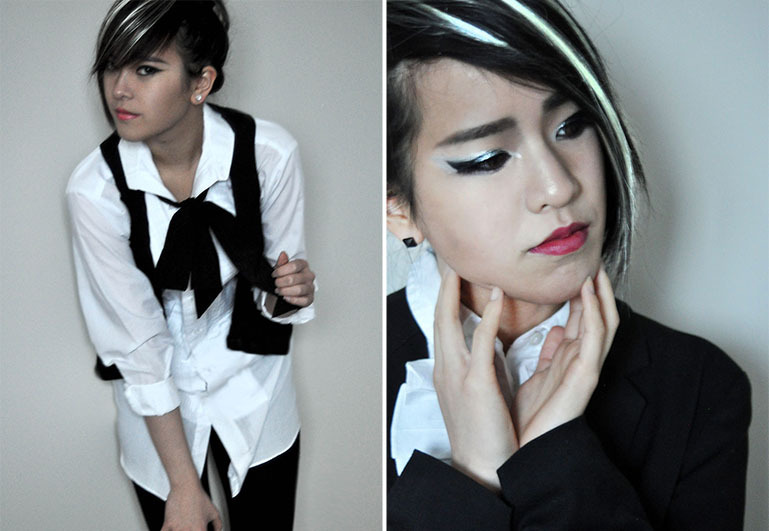 Doris and I wanted to create this look for some time now. 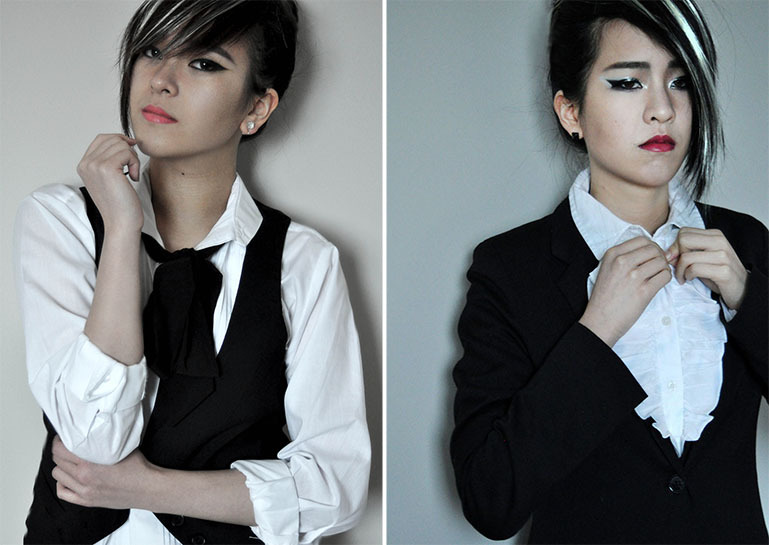 Fierce, masculine, but with a hint of femininity. We whipped out our white dress shirts, black blazers, and the rest came together. I was going through my dad's closet for a bow tie...but all I could find were boring colours, and silly ties with Snoopy or Flintstone print. Therefore, I used a ribbon belt from my shorts as my tie...I guess there's never any boundaries for being creative. For Doris' outfit, the ruffle of her dress shirt totally completes the look! On the makeup: A general makeup rule is to either only focus on the eyes or the lips. I decided to bend the rules a bit by having the focal point of this look on both the eyes and the lips. 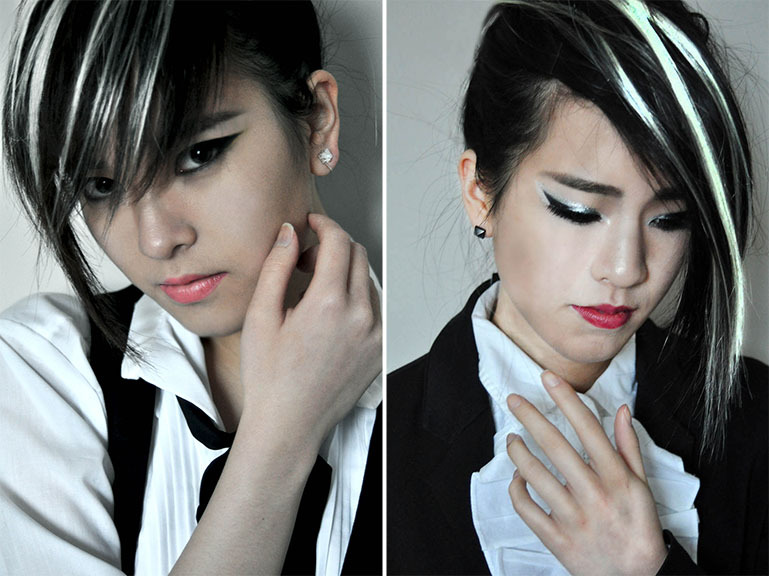 Oh, and I also didn't want the look to be too original (with the red lips accompanying the black and white outfit), so I decided to have some white and silver streaks added to our hair. The results came out to be pretty edgy!